Reinforcements for his troops came quickly and his conquest of a people soon moved into consolidation of an empire and its wealth. Spanish culture, religion, and language rapidly replaced Inca life and only a few traces of Inca ways remain in the native culture as it exists today. What remains of the Inca legacy is limited, as the conquistadors plundered what they could of Inca treasures and in so doing, dismantled the many structures painstakingly built by Inca craftsmen to house the precious metals. Remarkably, a last bastion of the Inca empire remained unknown to the Spanish conquerors and was not found until explorer Hiram Bingham discovered it in 1911. He had found Machu Picchu a citadel atop a mountainous jungle along the Urubamba River in Peru. Grand steps and terraces with fountains, lodgings, and shrines flank the jungle-clad pinnacle peaks surrounding the site. It was a place of worship to the sun god, the greatest deity in the Inca pantheon. Manco Capac, was the name of the last of the Inca rulers, and the son of Huayna Capac. 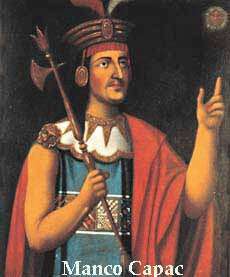 Manco Capac was supposedly crowned (1534) emperor by the Spanish conquistador Francisco Pizarro but was tolerated only as a puppet. He escaped, levieda huge army, and in 1536 laid siege to Cuzco, the Inca capital. The defense was commanded by Hernando Pizarro. Although the Incans had by now learned some European tactics of war they were outclassed by technical advantages. Manco Capac could not prevent dismemberment of his army at harvest time. The heroic siege, which virtually destroyed the city, was abandoned after ten months, but during the ensuing eight years the Inca's name became a terror throughout Peru. Manco Capac fought a bloody guerrilla war against soldiers and settlers. He was treacherously murdered in 1544, after giving refuge to the defeated supporters of Diego de Almagro, who had rebelled against Pizarro. In 1541 the Wheel of Fortune turned against Francisco Pizarro, and the conquistador reaped a bit of what he had sown. After the fall of Cuzco in 1533, Pizarro and his brother cut their rival, Diego de Almagro, out of much of the booty. By way of compensation, Francisco offered him Chile, and the Spaniard marched off in hopes of conquest and gold. He returned two years later, having found no fortune, and helped suppress Manco. His quarrel with the Pizarros led to a battle between their factions at Las Salinas on April 26, 1538. Captured, the defeated Almagro was garroted on Hernando's order. Francisco, now governor, later stripped Almagro's son, also named Diego, of lands leaving him bankrupt. The embittered young Almagro and his associates plotted to assassinate Francisco after mass on June 16, 1541, but Pizarro got wind of their plan and stayed in the governor's palace. While Pizarro, his half-brother Francisco Mart n de Alc ntara, and about 20 others were having dinner, the conspirators invaded the palace. Most of Pizarro's guests fled, but a few fought the intruders, numbered variously between seven and 25. While Pizarro struggled to buckle on his breastplate, his defenders, including Alc ntara, were killed. For his part Pizarro killed two attackers and ran through a third. While trying to pull out his sword, he was stabbed in the throat, then fell to the floor where he was stabbed many times. Alc ntara's wife buried Pizarro and Alc ntara behind the cathedral. He was reburied under main altar in 1545, then moved into a special chapel in the cathedral on July 4, 1606. Church documents from the verification process for remains of St. Toribio in 1661, however, note a wooden box inside of which was a lead box inscribed in Spanish: Here is the skull of the Marquis Don Francisco Pizarro who discovered and won Peru and placed it under the crown of Castile. In 1891, on the 350th anniversary of Pizarro's death, a scientific committee examined the desiccated remains that church officials had identified as Pizarro. In their account in American Anthropologist 7:1 (January 1894), they concluded that the skull conformed to cranial morphology then thought to be typical of criminals, a result seen as confirming identification. Wutz up pork and ham dude? pork and ham do you like maddie? from the otha page?